Looking for a refurbished Nitsuko phones, systems, component? You came to the right place. Here you will find most of the refurbished Nitsuko phones and components. If you dont see a component or telephone, please call us at 800-306-3377. We carry most Nitsuko phone sets , components and KSU's. The only line of Nitsuko that we carry very little of is the Nitsuko Portrait series. This is because there wasnt very much of this Nitsuko product made and therefore not a lot of the Nitsuko portrait series is out on the secondary market. If you are looking for Nitsuko Portrait phones and you dont see it on our website, please email us at sales@craigcommunications.net or call us at 800-306-3377 x1 to see if we have it in stock. Craig Communications carries most of the Nitsuko 384i and 124i phones, systems and components. Once again if you dont see a Nitsuko part listed on this page, or any other Nitsuko product page, please call us at 800-306-3377x1. The Nitsuko line has been around for a very long time and has recently been bought by NEC. When looking for a phone that is compatible with your Nitsuko phone system, always turn your phone over and look on the bottom for at five digit model number. This is to insure you are ordering the correct Nitsuko phone or component. Refurbished Nitsuko phones- Your One Stop Shop! Call us today to compare the Nitsuko 124i to the 384i phones and components and see which one is suited for you Nitsuko business phone application. Upgrading your telephones or system? Send us a list of your inventory. 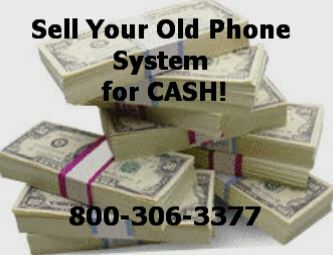 We will pay you Cash for your used refurbished Nitsuko phones or system!